When there is so much world to discover, an explorer yacht with the very best technologies and amenities is a must, regardless of whether you are heading to the sunny shores of Antigua or to the treacherous waters of Antarctica. 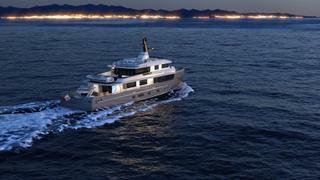 Explore further afield with the stunning 38 metre concept, Arcana. 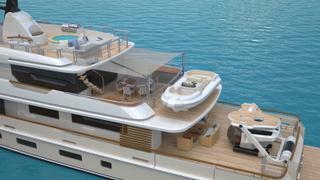 At the Singapore Yacht Show in 2014, Hansen met with the designer Horacio Bozzo, who could immediately see how his vision, for an explorer yacht that is “discreet but elegant, not too shiny, calling on classic yacht design”, could be brought to life. The result is Arcana, an elegant 38 metre motor yacht combining innovative technology with extensive exploration capabilities. An ultra-modern diesel-electric propulsion with azimuth thrusters offers more stability and manoeuvrability than conventional propulsion, enables the yacht to stay on station in a specific location for hours and reduces noise and vibration for improved guest comfort onboard. Advanced dynamic positioning allows the yacht to reach extremely challenging locations without the risk of dropping anchors on corals or disturbing sensitive seabeds. Designed to leave as small an ecological footprint as possible, Arcana has been technologically developed to offer the highest fuel efficiency and to adhere to the most stringent regulations for CO² emissions. She exceeds all current environment protection requirements, including IMO Nox Tier 3 emissions, and features a non-toxic hull antifouling coating with non-biocide-release in order not to harm the marine life. While this new technology is rarely seen within the yachting industry, it has been proven as highly successful in the offshore industry, which is where Hansen's roots lie and makes him confident its benefits will be embraced in yachting too. Arcana also boasts one of the most innovative features seen onboard any yacht, a patented submarine launch system, designed for a 3-man U-Boat Worx submarine. “When you go exploring, you can scuba dive to up to 30 metre, a bit more if you’re qualified, but there are a lot of very interesting subsea or underwater things you cannot see if you don’t have a small submarine,” explains Hansen. The purpose-built system, combined with dynamic positioning, allows a very controlled launch and recovery that feels much safer than traditional launches by crane. Passengers can board directly from the yacht, launch gently into the water and come back the same way. With its submarine, shallow draft and advanced exploration technology, Arcana is ideal for discovering the remote islands of Asia. “You can go to a very small cove or a small remote fishing port at the far end of Indonesia or the Philippines, and just turn around very easily with azimuth thrusters. Myanmar is opening to yachting, and it is a pristine world for diving with few yachts available there. Palau has shark sanctuaries ideal to explore on a submarine. 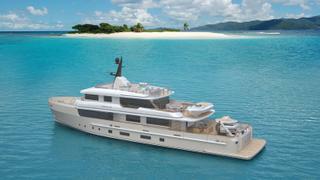 Asia is a wonderful playground for yachting and exploration,” says Hansen. There is no better way to discover this destination than onboard Arcana.